High capacity conveying for barns and semi-solid manure pits. 1/8" Copper bearing steel construction. 4" diameter, schedule 80, heavy wall tube in auger. Copper/steel alloy for housing. Optional steel liner for sand use. 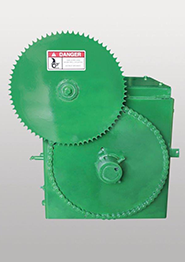 Strong roller chain drive 80 H on auger , 60 H on reducers. Circuit breaker used for overload instead of sheer bolt. 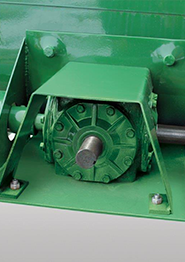 Electric motor drive output ranges from 3 hp to 15 hp, depending on auger length. Tractor horsepower requirements: Minimum 45 HP @ 540 RPM. 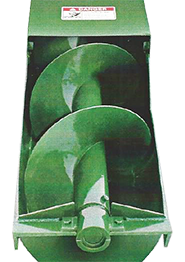 Larger diameter auger results in slower RPMs to maximum torque and reduce component wear. Custom built for your specific application with 15-40 foot lengths. Available with electric or PTO drive. Thrust bearing located on top end for easy lubrication. Install in existing structures, or new construction. Copyright © 2019 Sheahan Manure Augers | Manufactured by S.D. Ellenbecker. All Rights Reserved.